The Archangel Michael, who reigns as the leader of all God's angels, fights evil with the power of good. Michael has engaged in spiritual battles with the fallen angel known as Satan throughout history. The Bible says the struggle will reach a climax in the future, just before Jesus Christ returns to Earth. 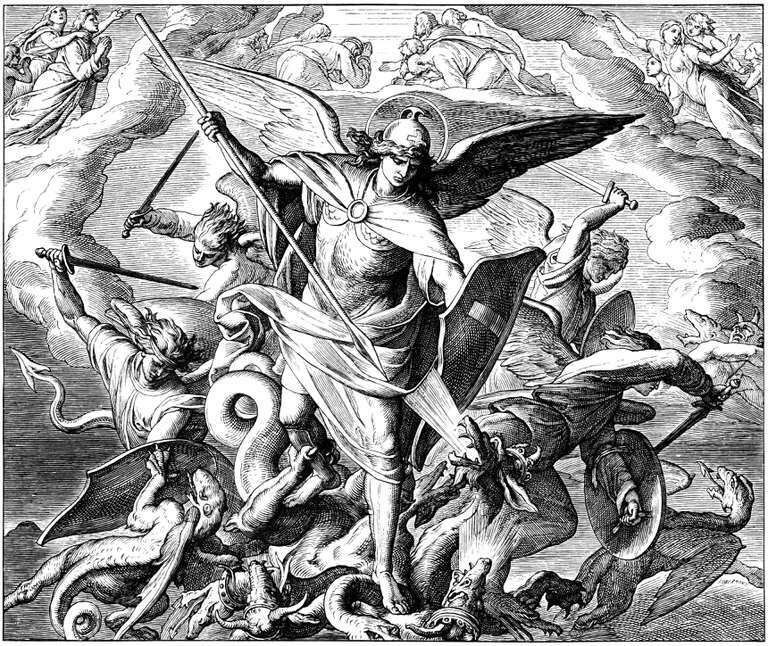 In Revelation 12:7-10, the Bible tells how Michael and the angels he supervises will defeat Satan and the other rebellious angels during the world's end time. "Then war broke out in heaven. Michael and his angels fought against the dragon, and the dragon and his angels fought back. But he was not strong enough, and they lost their place in heaven. The great dragon was hurled down—that ancient serpent called the devil, or Satan, who leads the whole world astray. He was hurled to the earth, and his angels with him." "The dragon represents evil, and there is no better angel than Archangel Michael, warrior for good, to battle darkness. The archangel rounded up his band of angel warriors and dispatched the fire-breathing monster and its army in one verse. Considering it is against the usual loquaciousness of the Bible’s authors, we can assume this one was a quick battle." The power of good is always far greater than the power of evil since God is the source of all that is good. Even though the battle can sometimes get intense, the victory will always go to those who are fighting for good. "Michael and the dragon have known each other since they were created, and the battle during the Tribulation will not be the first time they have opposed each other. Michael is always seen in scripture as the defender of God’s people against satanic destruction." Since Michael and Satan are well acquainted, they know exactly how to push each other's buttons during conflicts, just like siblings do when they argue. But there are far higher stakes to the conflicts between Michael and Satan: they affect everyone in the universe. "All of Satan’s attempts to oppose God throughout history have failed, and he will lose this final angelic battle as well .... Satan will suffer such a complete defeat that there will no longer be a place found for him and his demon hosts in heaven. Every inch of heaven, as it were, will be thoroughly scoured and all the rebellious fallen angels thoroughly cast out. They will no longer have access to God’s presence, and Satan will never again accuse believers before God’s throne." "What is this celestial conflict all about? The fact that Michael led God’s angels to victory is significant, because Michael is identified with the nation Israel (Dan. 10:10-21; 12:1; Jude 9). The name 'Michael' means ‘Who is like God’ and this certainly parallels Satan’s egocentric attack on Jehovah—'I will be like the Most High’ (Isa. 14:14). Apparently, the devil’s hatred of Israel will spur him to make one final assault against the throne of God, but he will be defeated by Michael and a heavenly host." In "Revelation Unveiled," Tim LaHaye writes: "The fact that Satan is once and for all cast from the throne of God along with his evil hosts ... will be cause for great rejoicing in heaven." "Then I heard a loud voice in heaven say: 'Now have come the salvation and the power and the kingdom of our God, and the authority of his Messiah.' For the accuser of our brothers and sisters, who accuses them before our God day and night, has been hurled down. They triumphed over him by the blood of the Lamb and by the word of their testimony; they did not love their lives so much as to shrink from death. Therefore rejoice, you heavens and you who dwell in them! But woe to the earth and the sea, because the devil has gone down to you! He is filled with fury because he knows that his time is short." Who Was the Angel Who Guided Moses During the Exodus? What Is the Black Stone of Mecca? How Do Guardian Angels Protect People?